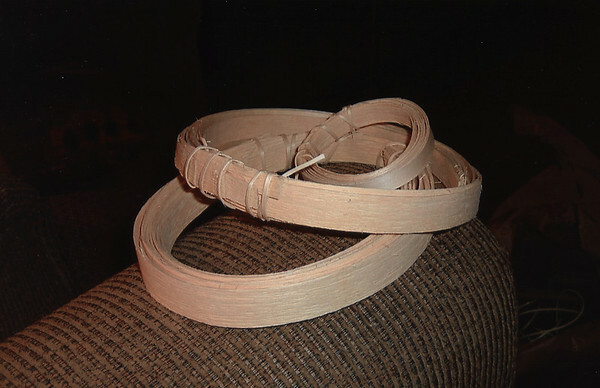 Frank Weese, of Traverse City, is one of Michigan's few Indian black ash splint basket makers. He provided the following pictures that show the steps to making a black ash basket. A large basket takes him about 48 hours to make over several days — from cutting the tree through weaving. His baskets are on display in the hallway exhibits at Turtle Creek Casino and Hotel in Williamsburg. For more on Weese and his baskets, see the Sunday article to appear at Record-Eagle.com/reflections or pick up a copy of Reflections magazine, available at area news stands. All photos courtesty of Frank Weese. Pounded strips are rolled up for storage and stored in a plastic bag when not in use.